I was driving on the freeway in Los Angeles, and the car in front of me had a bumper sticker on it that said “Chemtrails Kill.” Now, I love to laugh at the chemtrail people anyway, but this one had me almost pulling over to catch a breath, because the vehicle was not actually a car but a giant, Suburban-type SUV. The irony of this one is just way too thick to ignore. You are driving around in an eighteen-passenger, four-gallon-to-the-mile, urban assault vehicle on a road with a million other cars, worried about condensation happening at thirty-five thousand feet! Watch out: water vapor at one part per zillion is falling all around us! And let’s not pretend that “Chemtrails” are anything but that—water vapor accurately known as contrails. 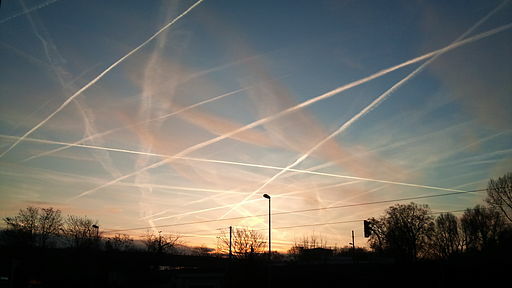 Contrails have existed since the invention of the jet engine. We know definitively what causes them. There is less secret involved here than why your windshield has that “mysterious” water on it every morning. We know more about the formation of contrails than we do about where that one sock goes when we do the laundry. The science behind contrails is more understood than the science behind what makes those One Direction kids so damn adorable. Regardless of those facts, we have still all probably run into at least one person who is convinced there is a government conspiracy at hand, though depending on who you talk to, you will get a completely different response as to what is trying to be accomplished via said conspiracy. I have heard everything from “controlling the weather” to “controlling our minds.” Controlling the weather always strikes me as odd since these conspiracy people almost always fall into one of two categories: 1) The Alex Jones climate change deniers or 2) People who rail against “Big Oil” and big business groups for their contribution to greenhouse gas production and their climate change denial. So, let me see if I understand this. . . . We can change the climate for the better, by using chemtrails, but for some unknown reason we choose not to, or the climate is changing, we are responsible, it is bad, but it is due to a magic additive in the airplane fuel not the reason 98 percent of climate scientists claim and therefore we should not worry about greenhouse gasses? Since this argument pretty much takes care of itself, I will address the most common chemtrail conspiracy I hear: mind control!